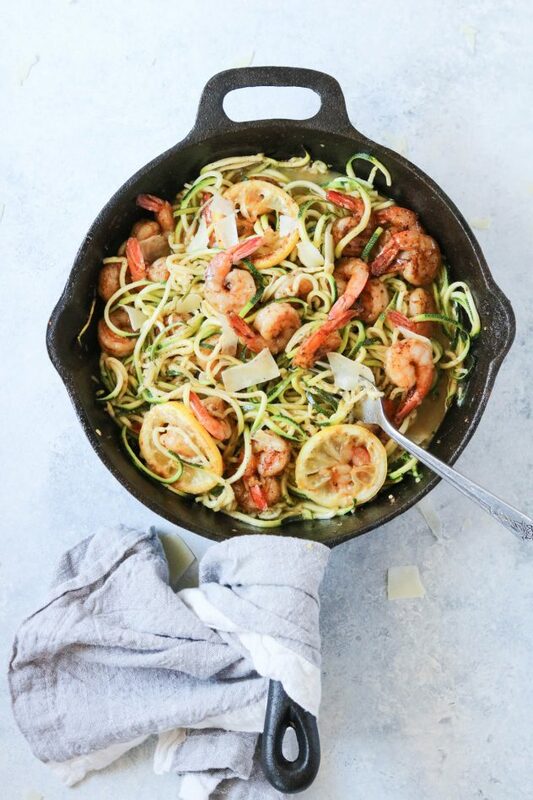 So many flavors happening with this blackened lemon shrimp with zucchini noodles! 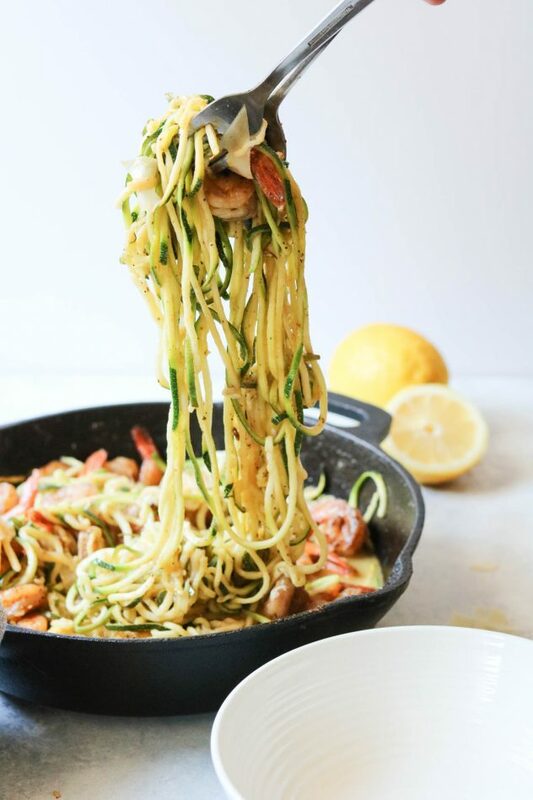 Let’s talk zoodles today, shall we? 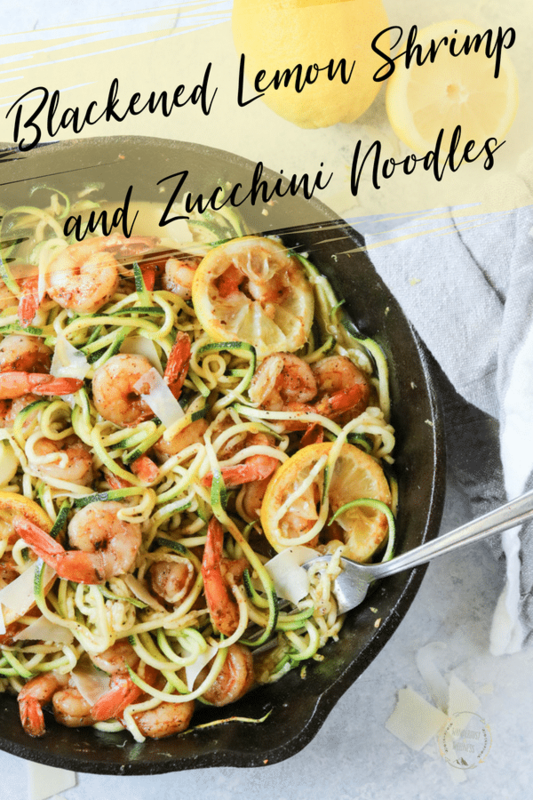 Zucchini noodles, otherwise known as zoodles, have gained in popularity as a low carb pasta swap in many dishes. If low carb is what you’re looking for, then this is definitely your dish. I don’t particularly follow a low carb or any diet restriction for that matter these days, but I will enjoy zoodles when my body craves them. Zucchinis have such a mild flavor they make a great option for a pasta swap. This dish reminds me of shrimp scampi, with its butter lemon sauce. I can remember as a kid my mom made shrimp scampi, served in traditional individual oval dishes, it felt so fancy! Looking back I’m so glad my mom chose to always cook dinner at home the majority of the weeknights (weekends were definitely for eating out!). Her own cooking experimentation helped me discover new foods, just like the night we had shrimp scampi at home. As a kid, I felt like I was dining at a 5-star restaurant. Zoodles are super easy to make, so don’t be hesitant to give them a try. I ordered a spiralizer off of Amazon for under $20, like this 5 Blade Spiralizer – Spiral Slicer, Vegetable Maker, Shredder. The spiralizer is very easy to use and you’ll have your zoodles ready to cook in a matter of minutes. Plus, zoodles also don’t require a long cook time so they’re perfect for a quick dinner, faster than it takes to cook pasta. You’ll want to be ready to serve the zoodles immediately after cooking, too. The longer they heat the more moisture they release, so if they sit too long you’ll end up with soggy zoodles. 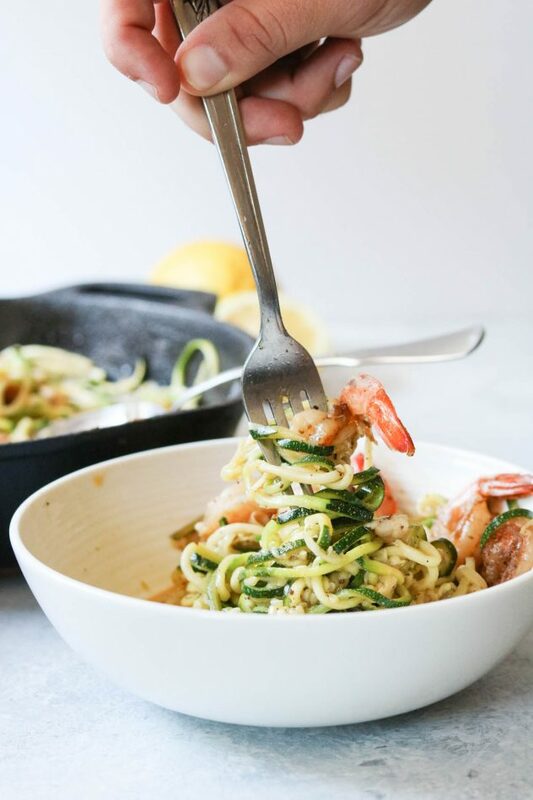 This blackened lemon shrimp with zucchini noodles is also an easy one skillet dish. 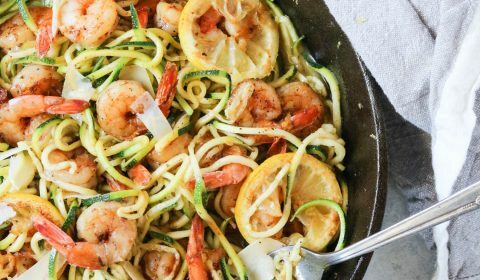 Just blacken the shrimp, remove from the skillet, add the zoodles for a short minute, then add the shrimp back in and it’s ready to serve! Heat a 12 in. cast iron skillet over medium-high heat, add 2 tbsp. of butter. Once the butter is melted, add the thawed, pre-cooked shrimp and season with cajun seasoning. Cook for 10-15 minutes or until the shrimp surface turns golden brown. Using a spiralizer, spiralize the zucchinis into zoodles. Set aside. Transfer shrimp from skillet to a plate and set aside. Add 1 tbsp. of butter, minced garlic, and lemon juice to the skillet. Heat for about 1 minute, then add in the zoodles and gently toss the zoodles to coat with the sauce. Cook for about 1-2 minutes. 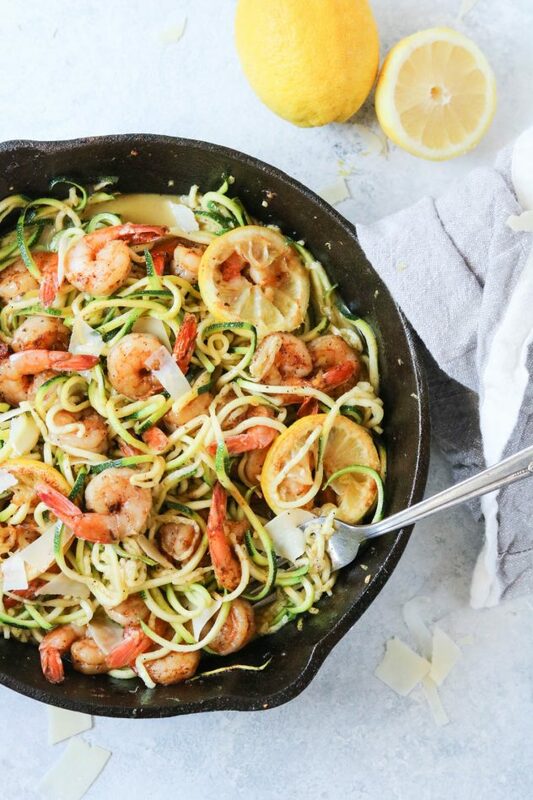 Add the shrimp back to the pan with the zoodles. Gently toss together then remove from heat. Top with lemon zest and parmesan cheese. Serve immediately.